UNC Family Medicine has recently been hosting a series of meetings featuring health leaders in eight surrounding counties to improve community health and well-being. 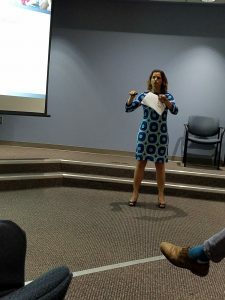 UNC Family Medicine has recently been hosting a series of meetings featuring health leaders in eight surrounding counties to improve community health and well-being. Sherry Hay, Director of Community Health at Family Medicine, coordinated the meetings after observing overlapping needs among these eight counties, needs including access to medical care and mental health. 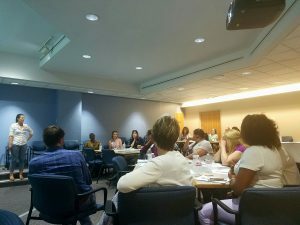 The group met first in October 2017, where leaders discussed the shared needs identified in each community in relation to the uncertain future of NC Medicaid. The most recent May meeting invited fifty health leaders to hear from NC State health Director, Dr. Betsey Tilson. The meeting also featured Healthy Communities Director for Cone Health, Kathy Colville, and Program Director with the Foundation for Health Leadership and Innovation, Will Broughton. Dr. Tilson spoke about how social factors may affect community health, and how the proposed NC Medicaid waiver – legislation that would replace Medicaid with an outside bidder – would address these factors. Dr. Tilson pointed out that 70% of health outcomes are tied to social and environmental factors. While the group’s goals continue to develop, Hay is optimistic about the potential of the group. “Given the excitement in the room and the dedication of leaders to help people in their communities, I believe we have potential to make a positive impact,” Hay said. The group will meet again in late June to continue discussions about addressing social factors that impact community health.